The village takes its name from one of two Native American Indian chiefs that first met British governor John White&apos;s expedition in 1585. Chief Manteo was the other. 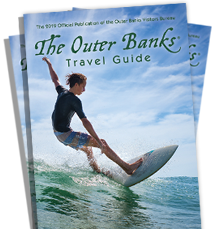 Today, Wanchese remains a key ingredient in the Outer Banks economy. The North Carolina Seafood Industrial Park is at the village&apos;s southeastern point, just a short drive from the Highway 158 intersection, down state road 345 leading right into the village. You&apos;ll see a sign on the left directing you into the park. It&apos;s worth seeing. Here, at the mid-point of the East Coast of the United States, is a major fishing hub. Shrimp trawlers, flounder boats, huge vessels go out for weeks at a time gathering fresh seafood from waters up and down the Eastern Seaboard and the coastal and inland waterways of North Carolina. Much of the fresh catch ends up on the specials menu at our local Outer Banks restaurants. Some gets shipped packed in ice all across America. From Wanchese, most of the great attractions of Roanoke Island and Manteo are just a few minutes drive. Roanoke Island Festival Park, the North Carolina Aquarium on Roanoke Island, Elizabethan Gardens, Fort Raleigh National Historic Site, and Bodie Island Lighthouse are all just ten to fifteen minutes away. Whether you stay in a quaint beach bed and breakfast or a rental cottage, you’ll have plenty of things to do in Wanchese.